Seals & Protects Hoof Cavities & Abscess Wounds. Keratex Hoof Putty seals and waterproofs horn separation cavities, preventing germs from compromising hoof health. Self-adhesive, flexible and won't drop out or deteriorate. Seals and stabilizes hoof cavities caused by seedy toe, white line disease and other hoof conditions resulting in horn separation. Prevents grit and stones from entering the hoof. Can support tubes for flushing or draining cavities. A unique type of malleable wax containing slow release organic disinfectants and antibacterials. Use to fill cavities left by conditions such as seedy toe and after the removal of abscesses from the sole. The broad spectrum organic disinfectants in Keratex Hoof Putty are effective in treating both fungal and bacterial problems. Start with a clean dry hoof. Wash and dry hands as well. 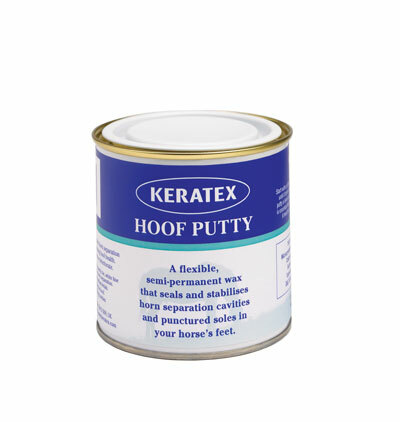 Work a piece of Keratex Hoof Putty in your hands until it turns soft and tacky. Press this piece of putty into the cavity. Repeat until the cavity is filled and putty is level with surrounding horn or sole. When shoeing over or close to areas filled with Hoof Putty it is essential that only cold shoeing or gluing is used. Where Hoof Putty has been applied under a shoe, it must be replaced at next shoeing. In all other cases check weekly and replace as required. Once inserted, Keratex Hoof Putty hardens to its former state, providing a good seal against water and dirt, and can be used on either shod or unshod hooves. Keratex Equine Hoofcare and keratex.net are part of Dogwood Hill Enterprises, LLC.